Show Me creates a view based on the fields already used in the view and any fields you’ve selected in the Data pane. Open Show Me by clicking Show Me on the toolbar . To use Show Me, select the fields you want to analyze in the Data pane, and then select the type of view you want to create in the Show Me pane. Tableau automatically evaluates the selected fields and gives you the option of several types of views that would be appropriate for those fields. Show Me also highlights the visualization type that best matches the data. Select fields in the Data pane that you want to analyze. Hold the Ctrl key (Command key on a Mac) to make multiple selections. Any view type that is not gray will generate a view of your data. As you hover over each view type, the description at the bottom shows the minimum requirements. In this example, Stacked Bars is selected. In this example, you use Show Me to create a line chart that displays profit as a function of time. Select [Order Date] and Profit in the Data pane. Hold down the Ctrl key (or the command key on a Mac) as you select the fields. Click Show Me on the toolbar to display the Show Me card, if it isn't already displayed. In the Show Me pane, see what type of view Tableau suggests. 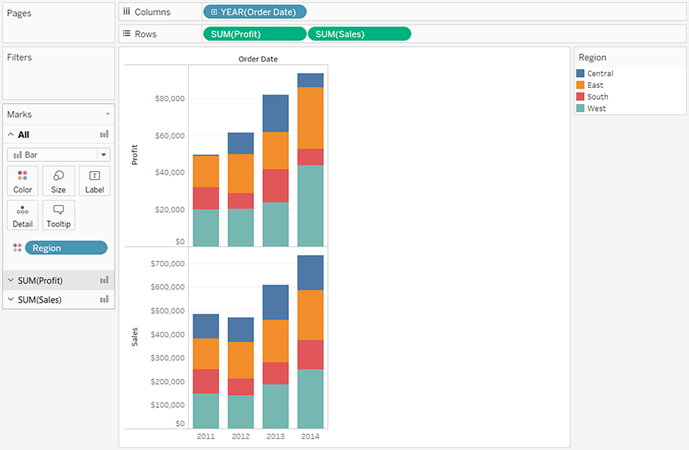 Because a date dimension and a measure are selected, Tableau suggests you build a line view. A line is often the optimal way to look at how measure values change over time. The view below shows the resulting chart. Each point on the line represents the sum of profit for the corresponding year. You can more easily see the points by clicking the Show Mark Labels button on the toolbar. In this example you use Show Me to build a scatter plot to show sales versus profit for each product and customer. Select Customer Name and Product Name (from the Dimensions area in the Data pane) and Profit and Sales from the Measures area. To select multiple fields, hold down the Ctrl key (or the command key on a Mac) as you click fields. 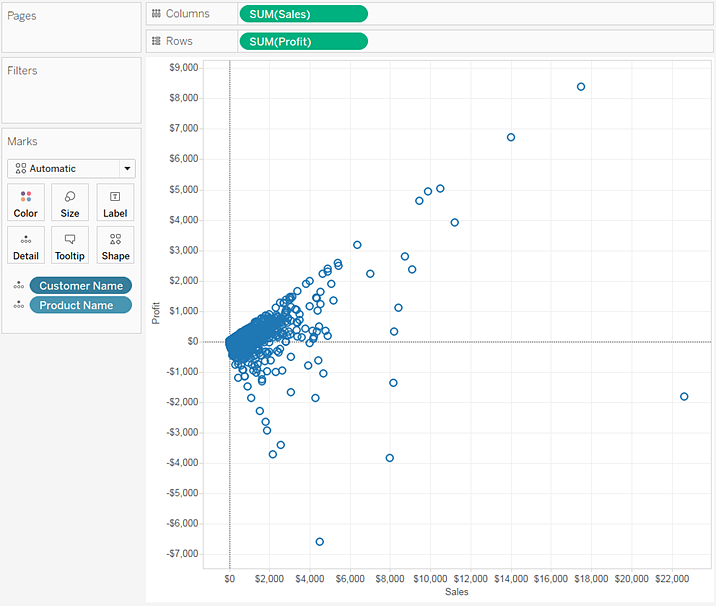 Select the scatter plot chart type from Show Me. 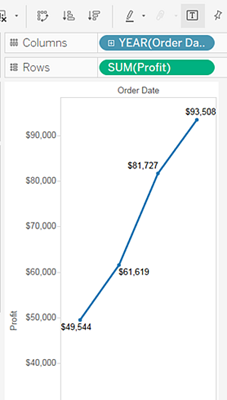 Tableau creates a scatter plot using the fields you selected. You can drag fields to further refine the view.